With nearly two centuries of expertise, de Buyer's mission is to provide top-quality kitchen essentials crafted with knowledge and methods passed down through generations of workers. Established for more than 180 years, de Buyer takes great pride in its "Made in France" heritage, boasting the prestigious "GUARANTEED FRENCH ORIGIN" label. Generations of workers have fine-tuned and passed along their rich, rare know-how allowing traditional methods to live on and ensuring each product is manually stamped, cut, bent, welded, and polished with the utmost care. With every product, de Buyer provides a limited 2-year manufacturer's warranty, taking great care to guarantee exceptional customer satisfaction. The Appety line by de Buyer Professional brings innovative, multi-purpose cookware to every kitchen utilizing affordable, yet high-end materials. Professional quality stainless steel allows for the cookware to possess a magnetic-coated heat diffusing bottom. This bottom perfectly distributes heat and allows it to be suitable for not only traditional cooktops, but induction tops as well. 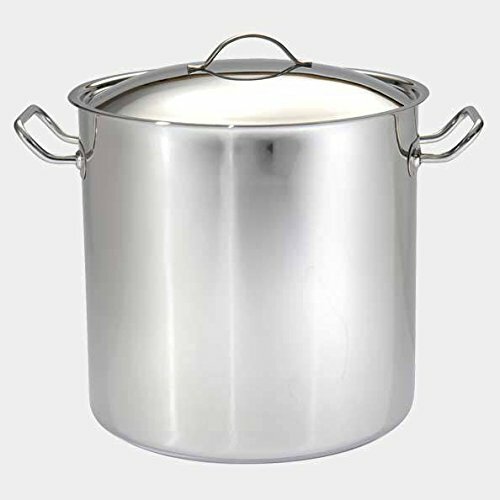 The 32 cm Appety stockpot has a tediously rounded skirt and bottom, guaranteeing no sharp corners and simplified content control. In addition to excellent content control, each pot and pan comes with ergonomic stainless steel handles and a perfectly fitted lid. The handles, designed to promote a cooled, easy grip, are welded at multiple points and permanently marked for traceability. In addition to these carefully crafted features, Appety cookware boasts an attractive mirror polished finish on the stainless steel that allows each piece to be durable and long lasting, as well as cleaned simply, utilizing a dishwasher. Stainless steel handles welded at multiple points promote a sturdy, cooled grip. If you have any questions about this product by de Buyer Professional, contact us by completing and submitting the form below. If you are looking for a specif part number, please include it with your message.